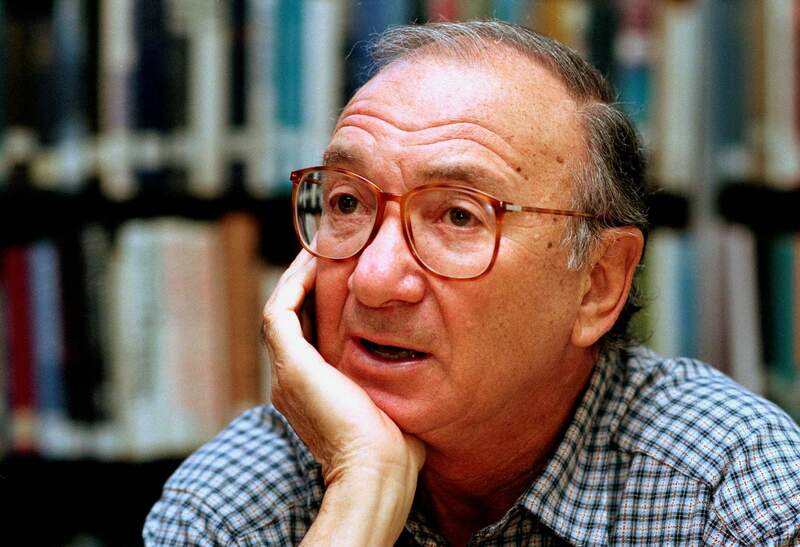 American playwright Neil Simon answers questions during an interview in 1994 in Seattle, Wash. Simon, a master of comedy whose laugh-filled hits such as “The Odd Couple,” “Barefoot in the Park” and his “Brighton Beach” trilogy dominated Broadway for decades, died on Sunday. He was 91. NEW YORK – When master playwright Neil Simon accepted the Mark Twain Prize for American Humor in 2006, he was visibly nervous. But his gentle humor was evident. Simon’s stage successes included “The Odd Couple,” “Barefoot in the Park,” the “Brighton Beach” trilogy, “The Prisoner of Second Avenue,” “Last of the Red Hot Lovers,” “The Sunshine Boys,” “Plaza Suite,” “Chapter Two,” “Sweet Charity” and “Promises, Promises.” Many of his plays were adapted into movies and one, “The Odd Couple,” even became a popular television series. Simon’s ability to recognize life’s little annoyances – too many pillows piled on a sofa, being told as a kid you may not eat any more cookies – connected with audiences. A scene in “The Odd Couple” when Felix Unger passive-aggressively leaves a note on Oscar’s pillow – “We’re all out of Corn Flakes. F.U.” – got huge laughs. The bespectacled, mild-looking Simon (described in a New York Times magazine profile as looking like an accountant or librarian who dressed “just this side of drab”) was a relentless writer – and rewriter. Simon’s own life figured most prominently in what became known as his “Brighton Beach” trilogy – “Brighton Beach Memoirs,” ‘’Biloxi Blues” and “Broadway Bound” – which many consider his finest works. In them, Simon’s alter ego, Eugene Morris Jerome, makes his way from childhood to the U.S. Army to finally, on the verge of adulthood, a budding career as a writer.